STILL showcases the recent work of fine art photographers Cara Romero, Will Wilson, Kali Spitzer, Robert Mesa and Zoe Urness . Their compelling photographic images of water, dance and stillness explore concepts of suspension and continuance in a rapidly changing world. Global changes in climate, environment and economies have impacted significantly in the most vulnerable areas of the world, and Indigenous North Americans see these effects daily. Chemehuevi artist Cara Romero draws these delicate relationships to a fine point in her series ‘Water Memories’. Her breathtaking underwater images expose the fragile and essential relationships that exist between people, water and life. These beautifully conceived photographs show an immersed environment where the Native American figures are portrayed under the surface, suspended in a drowned landscape. Distinguished Diné artist Will Wilson’s tranquil, panoramic self-portrait captures a prayer offering by the lone figure of the artist within a vast waterscape. From his on going series ‘Critical Indigenous Photographic Exchange’ (CIPX), Wilson uses the early photographic technique of tintype to present modern static images of dancers in an historic fluid medium. Kali Spitzer (Kaska Dena / Jewish) also experiments with the wet plate alchemical process of tintype producing magical and magnificent portraits of contemporary Indigenous women who appear as if through an antique mirror. Navajo photographer Robert I Mesa captures fleeting moments of inter-tribal pow wow with his incandescent portraits of Fancy Dancers. Zoe Marieh Urness (Tlingit & Cherokee) creates timeless sepia toned portraits of Indigenous landscapes containing contemporary Native Americans still ‘Keeping The Traditions Alive’. This exhibition presents technically and aesthetically brilliant images that together speak of the strong identities, cultures and connections to Mother Earth still thriving at the heart of Indigenous communities. 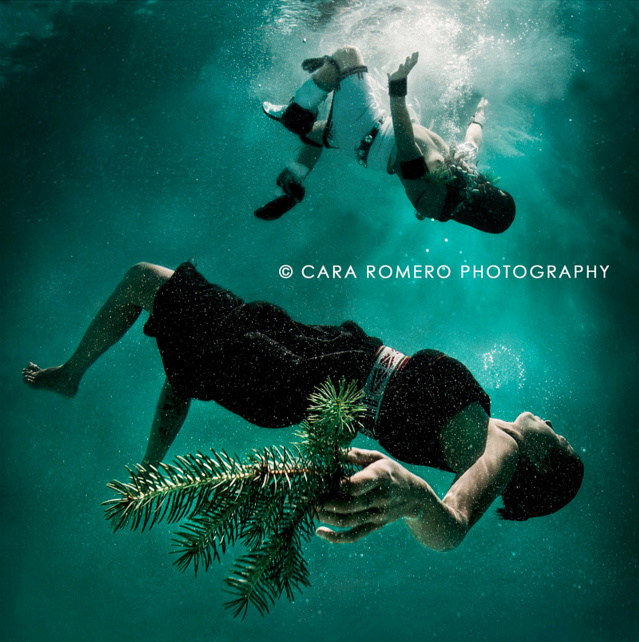 To book for the Artist’s Talk with Cara Romero please contact the gallery. The talk will take place at Redland Quaker Meeting House, 126 Hampton Rd. BS6 6JE. The cost is £7 per person. Further talks will be held at The American Museum In Britain with both Cara Romero and Diego Romero on the 20th and 22nd April respectively.